Robert Porter from The Phoenician’s Thirsty Camel Lounge took the top prize at the Devour Phoenix Bartending Competition on Sunday, February 28, at the DeSoto Central Market. Robert reached the final round by winning Heat 3 of the competition with a drink called “Cinnamon Samurai” made with OHSO Distillery’s #Gin. 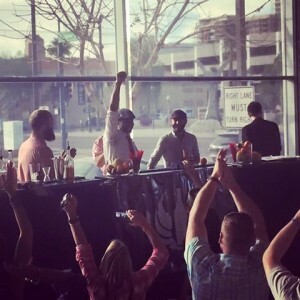 In the final round, Porter faced Michael Liberatore from Citizen Public House, who won Heat 1 mixing the “Na-Na-Na Boo Boo” with Arizona Distilling Desert Dry Gin, and Zach Smith from Welcome Diner, who won Heat 2 mixing the “Hola Vera” with 3 Amigos Tequila’s Organic Blanco Tequila. In the final round, the three bartenders took to the Bar & Restaurant Insurance Main Stage and were surprised with an assortment of locally produced mystery items and a selection of spirits from Three Wells Distilling Company. Bartenders were able to select whatever ingredients they wanted to use to create their improvisational cocktail, which was then reviewed by the panel of judges. Porter’s winning drink was called the “Opal Sour” and was made with Three Wells Distilling Copper (an aged spirit distilled from prickley pears), honey vinegar (Singh Farms), lemon juice (Steadfast Farms), simple syrup, egg white (Steadfast Farms), orange zest (Steadfast Farms), and opal basil (Dig It Urban Gardens), and had a Meyer lemon sugar rim (Terre Botanicals). Michael Liberatore from Citizen Public House took the second place Copper Cup Award, and Zach Smith from Welcome Diner finished in third place. Rob Moore from Windsor won the People’s Choice Award for his drink mixed with OHSO Distillery’s #Gin mixed with ginger, cucumber, and cilantro. As the first place finisher, Robert Porter will be featured in an exclusive mixology demo at the 2016 Devoured Culinary Classic VIP Lounge, showcased on the website of Arizona’s own Bite Magazine, and featured in a collaborative video made by local videographer Andrew Gooi. He also took home the Arizona Bartender’s Craft Kit valued at over $200, and was crowned with the coveted title of Arizona’s Star Bartender. The Devour Phoenix Bartending Competition was also successful in diverting over 200 pounds of waste from landfills through composting and recycling efforts through a partnership with Keep Phoenix Beautiful.